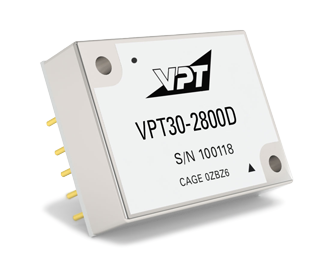 VPT30-2800D DC-DC Converter | VPT, Inc. The VPT30-2800D Series of DC-DC converters are designed specifically for military vehicles, weapons, shipboard, avionics, and other hi-rel applications. Important features such as a fixed switching frequency and frequency synchronization ensure this converter will provide steady power to your exact specifications. These converters are based on proven military heritage electrical designs and packaged securely in six-sided metal packages for rugged duty.